Infection with human papillomavirus (HPV) (genotypes 16, 18, 31, 33, and 45) accounts for approximately 85 per cent of invasive cervical cancer. While the risk of HPV infection is greatest in young women, older women are also at risk of cervical cancer. HPV vaccines used in public health vaccination programs target adolescent girls before sexual debut. There is also strong interest in vaccination among adult women, especially those who are aware of the risk of cervical cancer and attend screening regularly. Vaccine Immunogenicity and Efficacy (VIVIANE) is a clinical trial investigating the effectiveness of a HPV vaccine in healthy adult women over a seven-year period (phase three, multinational, doubleblind, randomised controlled trial). More than 5500 healthy women aged 25 years and older from Australia and 11 other countries were assigned to the HPV-16/18 vaccine or control group. 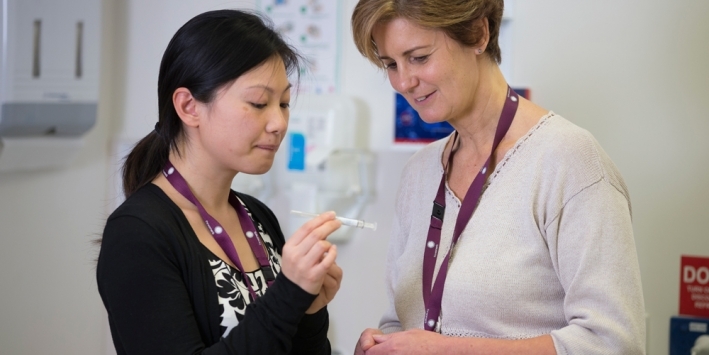 At the 48 months follow-up,results demonstrated the efficacy of the HPV-16/18 vaccine against infection and cervical abnormalities associated with HPV-16 and HPV-18 in adult women. The HPV-16/18 vaccine also showed efficacy against infection associated with other HPV genotypes (HPV-31 and HPV-45).